When a bunny is born in spring, he sees the world as green and new and full of hope. But as the seasons change, the bunny worries that the earth may be dying. 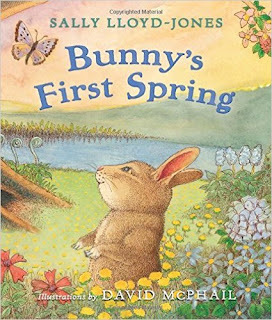 In bestselling author’s Sally Lloyd-Jones’ latest picture book celebrating the Easter season and rebirth, nature speaks to the bunny, assuring him of something more. Award-winning artist David McPhail’s whimsical illustrations reflect the beauty of the world around us as Lloyd-Jones’ inspirational text prompts readers to celebrate the changing seasons and the miracle of nature’s rebirth. Bunny's First Spring by Sally Lloyd-Jones in an incredibly cute children's book! Bunny's First Spring follows a bunny born in spring through the four seasons. Bunny notices the changes in the seasons and fears that the earth is dying. His parents reassure him everything will be fine and the bunnies fall asleep in winter and wake up to a beautiful spring setting where life has been refreshed. I think this is a fabulous book and a great way to teach children about the seasons and that God can make all things new. The illustrations throughout the book are beautiful and I absolutely love the way Sally Lloyd-Jones brings the story to life. This is an wonderful book and a perfect gift this holiday season, especially since so many of us will be looking forward to warmer spring weather. You can find Bunny's First Spring on Amazon, Barnes and Noble and other bookstores.